Individual churches in Shirley may be members of Churches Together in Britain and Ireland (CTBI), and the national ecumenical organisation Churches together in England (CTE), through their denomination or organisation. Welcome to Churches Together in Shirley near Croydon. 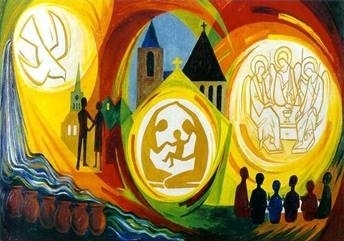 Picture above is Triptych with three panes where a couple come from two distinct church traditions, but they share one baptism. This Lent the Shirley Churches are showing the film by Ken Loach I, Daniel Blake at St George's Church in Elstan Way. The course continues each Sunday from 6pm at St George's Church during Lent. The Shirley Churches ran the popular Lent course based on the Les Misérables film in 2018. Please see What's On tab for dates of events or click the blue "Churches and community events" box to the right of this text. The Shrublands Community Trust Foodbank in the Advice Centre at 7 Broom Road, Shirley is open on Fridays from 1.00-3.00PM. Donations of "in date" cans of food are welcome. The Foodbank looks after about 10 people a week who cant afford to feed themselves. A link to the PDF for list of food needed each week is Here . Assistance is provided with transport to and from GPS's and other medical appointments. There is a regular shopping bus and prescription collection. A Lunch club is being run at the Methodist Luncheon Club and takes place every Thursday from 11:30 and there is a waiting list so please phone below. The most recent Unity service is at All Saints Church. The theme is Only Justice. © Shirley (Croydon) 2019. This website may use newsfeeds from and links to other websites: we accept no responsibility for their contents.